Duncan joined up with this program mid-way through the 2013-2014 season. At the time he was four and a half years old and had pretty much mastered the "walk-skate" thing at public skate and we'd kinda hit a roadblock when it came to actual progress. Coach Scott Miller is an intimidating force on skates. 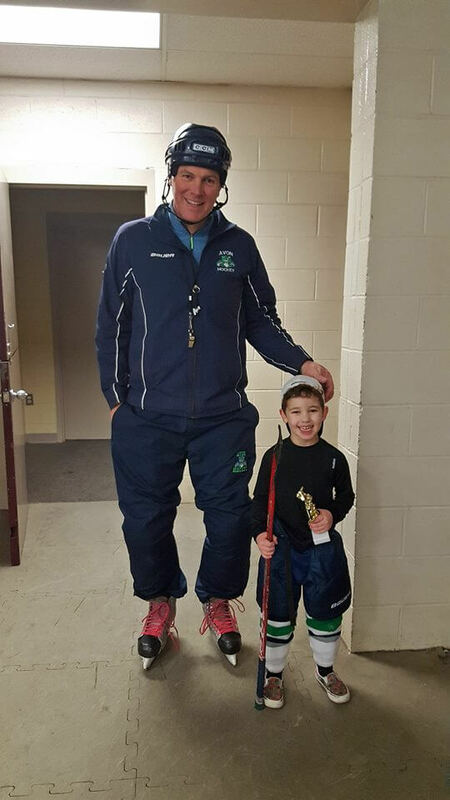 Towering over the children and wearing those Bauer skates that sound like giant claws on the ice -- you know it when you hear it -- he is the definition of what you'd expect a hockey coach to look and sound like... but not for a 4-year old. That said, while looking like a huge scary hockey player physically, he's somehow mastered the ability to communicate with young children in a rather unfamiliar environment. I mean, you have to give credit where credit is due -- it can't be easy to teach 50+ kids to play hockey in that age group. For instance, Duncan really thought there were invisible rockets in his skates that made him go fast. The kid next to him thought he was an idiot. But Coach Scott somehow connected with both of them and that's what makes him a great coach. The kids look up to him, they want to be him, and I think that's something that's truly hard to find these days. 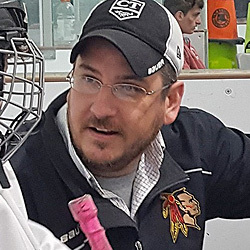 Further, he's surrounded himself with an assortment of assistant coaches who aren't nearly as intimidating physically as he is, but are just as welcoming to the kids on the ice. Good people are hard to find -- Coach Scott has found them. So, anyway, with very limited one-on-one attention, Duncan went from a walking skater to a full fledged skater striding like an NHL player in 3 practices. As a mildly frustrated parent who'd seen his progress stall for nearly six months, it was downright amazing to watch how much progress he was making from week-to-week. My second son, Henrik, joined the program the following year, 2014-2015, and the experience was much the same. He hasn't faired as well as Duncan due to a bully problem and some fear of a real shark lurking during sharks and minnows (a game kind of like tag) but a lot of that is likely attributable to his young age and not the coaching staff. Even such, Coach Scott has personally pleaded with him to come out on the ice while he hid behind my leg. Even if it didn't work -- Henrik refused to take the ice for 90% of the season -- Coach Scott's focus is to get everyone out there playing hockey and having fun.